Probably one of the area's favorite local attraction is Great Falls. Located about 14 miles northwest of Washington, Great Falls marks the point at which the Potomac River dramatically enters the mid-atlantic piedmont area. Thanks to the C&O Towpath and MaCarthur Blvd, just about the best way to visit the park is by bicycle. This route has been a big favorite for many years, and the completion of the Capital Crescent Trail has really made this a jewel. The route has several great traits, such as the wonderful scenery along the deep Potomac Valley, the number of historic points-of-interest along the route, and the fact that this route is just about as flat as you will find in these parts. I've started this route at the Capital Crescent Trail (CCT) head in Georgetown (west end of Water Street, underneath Whitehurst Freeway). The first 2.5 miles follow this paved trail out to Fletcher's Boathouse, where the ride switches to the unpaved towpath. 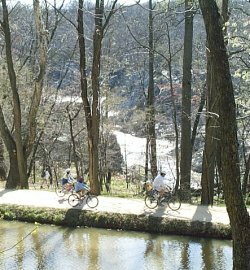 From here, the ride follows the unpaved C&O Towpath for the next 11 miles along the Potomac River. At mile 12 into the ride, you will encounter a quarter mile long rocky breach section in the area known as Widewater. This section has been impassable by bicycle for at least 30 years, so you will need to carry your bike here. If you prefer, a detour route is available at the Widewater area entrance (mile 11). Soon past the breach, a grand view of the Mather Gorge marks your arrival at the Great Falls area. The actual falls are visible by using the overlook walkway (make sure you bring along a bike lock). Flood Gate marking north end of bicycle detour. For the return trip, you could head back the way you came. However, a nice alternative is available by using the MaCarthur Blvd Bike Path. MaCarthur Blvd is basically down hill all the way back to town, thanks to the fact that it is built on top of two huge gravity based water supply aqueducts. To access this bike path, start back the way you came. After passing the Mather Gorge overlook, roll your bike up the stairs to the top of the wood/stone flood gate and cross over the canal (may be marked as Bicycle Detour). This will lead you up to the aqueduct access road, which eventually becomes MaCarthur Blvd. The bike path always seems to be in various states of disrepair, however no problem for ATBs or hybrids (many prefer to ride on the roadway). 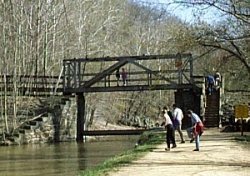 The path does pass near some interesting landmarks, such as David Taylor Research Center (the mile long building), the Cabin John Bridge, and Glen Echo Park. The MaCarthur Path ends at Dalecarlia Reservoir. At this point, the route switches back to the Capital Crescent trail (via the Little Falls Trail) which takes you downhill back into town.. If you live outside DC or are passing through the area, a great alternative starting point would be the Carderock Recreation Area. Located about 1 mile west of I-495 just off the Clara Barton Parkway, Carderock offers very easy access from the Beltway and plenty of free parking. At this point you will pick up the route near mile 10.